ProRodeo Hall of Famer and two-time Saddle Bronc Riding World Champion Deb Copenhaver passed away late at night after going to sleep Feb. 6 at his home in Creston, Wash., a few weeks after his 94th birthday, said his son Jeff Copenhaver. 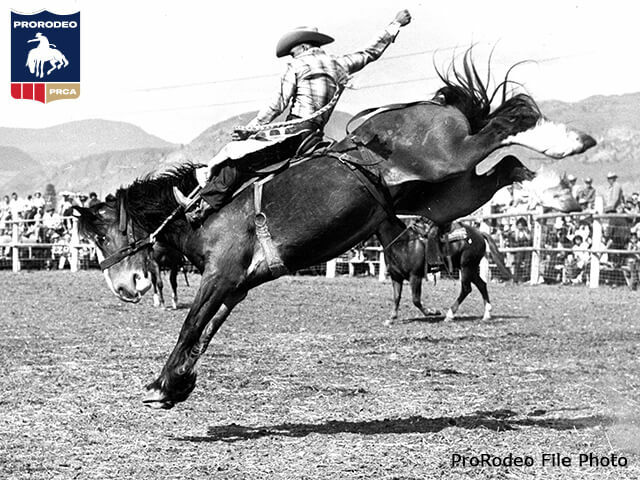 Copenhaver is considered one of the greatest bronc riders to come from the Pacific Northwest. Known as a “thinking” rider, Copenhaver started the style of the “dehorned” saddle, now required in saddle bronc riding competition. He did it partly by accident. After a bronc mashed the horn when it ran into the unsaddling chute, Copenhaver whittled off the rest of the horn and a new style was born. Rodeo runs in the Copenhaver family’s blood as his son, Jeff, was the 1975 Tie-down Roping World Champion, and his daughter, Deborah, is a former Miss Rodeo Washington and a respected bronze sculptor. Born in Wilbur, Wash., Jan. 21, 1925, he began breaking horses and exercising racehorses as a young boy. He entered his first rodeo at 15. He enlisted in the Navy Seabees at 17 and spent two years in North Africa during World War II. After the war, Copenhaver worked as a logger in the Northwest for a couple of years before embarking on his rodeo career full time in 1948. 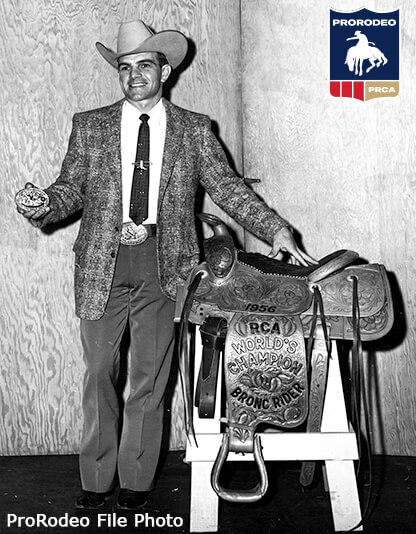 Copenhaver won saddle bronc riding world championships in 1955 and 1956, was runner-up to Casey Tibbs three times (1951, ’53 and ’54) and was inducted into the ProRodeo Hall of Fame in 1992. Nicknamed “Fireplug” as much for his fiery, competitive nature as his stocky build, the 5-foot-7 Copenhaver won plenty of big rodeos – Calgary in 1953, ’55 and ’58; Madison Square Garden in 1952 and ’55; Pendleton (Ore.) in 1954; Salinas (Calif.) in 1952; Denver in 1956; and Fort Worth (Texas) in 1954. To win his 1955 title, Copenhaver traveled more than 90,000 miles, hit both coasts and Canada, and ventured as far south as San Antonio. One weekend, he chartered a plane to enter seven rodeos in five states (four of which ran concurrently). He went on to serve on the PRCA Board of Directors from 1986-89. When he was 88 years old, Copenhaver built a tiny, roadside chapel on his ranch about 50 miles west of Spokane, Wash.
Copenhaver is survived by his kids, Jeff, Deborah, Matt, Kelly and Guy, as well as numerous grandchildren. For the full story, check out the Feb. 8, 2019, digital edition of ProRodeo Sports News.